The long-awaited Minecraft: PS3 Edition chisels its way to PlayStation 3 consoles in North America December 17 (and December 18 in the UK and Europe), developer Mojang has revealed. 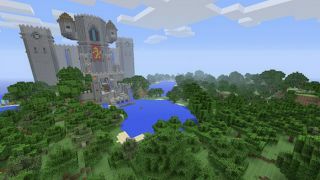 The PS3 version of Minecraft is identical to and will cost about the same as the Xbox 360 edition, Mojang Chief Word Officer Owen Hill wrote in a blog post. They'll be developed in tandem from now on so neither will jump ahead feature-wise. Downloadable skins and texture packs will appear in the PlayStation Network store soon, and Sony-exclusive DLC is a possibility. Hill also addressed the questions of PS3/PS Vita/PS4 remote play or crossplay compatibility, but unfortunately didn't have any concrete answers. Read more of TechRadar's blips! Can ya dig?